Our road trip continues… we left the stark beauty of Utah behind for the big sky country of Montana (we also drove through Idaho and saw just enough to make me think it would a grand place to come back and visit). It never ceases to amaze me how the United States has such diverse landscapes – in the course of one day you can go from the amazing rocky landscapes of Utah and find yourself in the rolling wildflower-covered valleys and majestic mountains of Montana. We spent one night in Butte, MT where we stayed in another La Quinta then moved on to Kalispell which I thought would be more scenic. Well, it was scenery of a sort – we were next door to the city’s recycling center/dump! 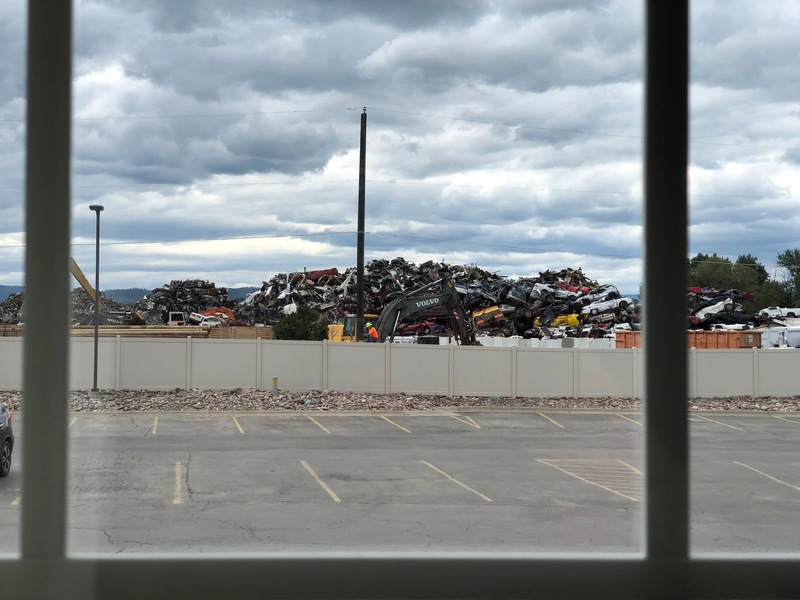 So we had a view of mountains – of garbage! After that not-very-scenic experience we decided to treat ourselves and moved on to Whitefish (gateway to Glacier National Park!) and stayed at the Grouse Mountain Lodge, a big step up from La Quinta-type accommodations. We even ate at a real restaurant versus picnics in our room or take out/ fast food. 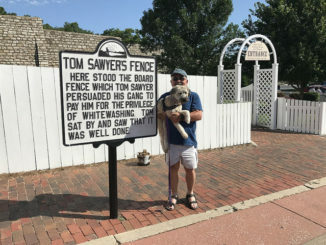 Montana’s health code restrictions are such that dogs aren’t allowed in any restaurants or in outside seating areas (really, Montana?!?). So rather than leave Maggie to her own devices we sucked it up (and saved a lot of money), took one for the team and ate in with her. We left Whitefish and headed into Glacier National Park and the engineering marvel that is the Going to the Sun Road. Back in 2001 I went on a multi-day bike ride in Montana/Alberta and the highlight of the trip was the day we all rode our bikes up Going to the Sun Road. I can tell you that driving is easier! Chuck saad more than once as we drove it, “You road your bike up this?! ?” Yes, yes I did. We stopped at all the turnouts and were constantly amazed at the breathtaking views. It was a pretty day but cold and the clouds moved in and out (which really added to the beauty of the place) but the rain held off until we were on the other side of the border in Waterton Lakes National Park. 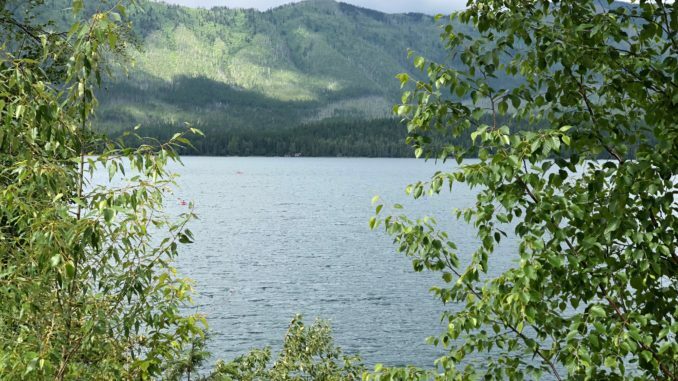 We thought about spending the night in Waterton, but in all of our planning we failed to take into account July 1 – Canada Day – a big holiday up here. We also didn’t realize the impact of the Kenow Fire, which burned over 19,000 acres of the park – currently over half of the park is closed due to fire damage. The damage is evident everywhere you look – the amazing thing is that Waterton Village was spared. We checked several of the hotels in in the village but there was no availability and all the campgrounds were full so we left and started on our way toward our next stop – Banff National Park. We stopped for the night in Lethbridge and are staying at a pet friendly Holiday Inn which has, oddly enough, an indoor water park. Staying at the hotel gets you free entrance but we decided to pass as by the looks of it we are decades too old to properly appreciate its wonderfulness. The forecast calls for more rain and colder temps for the next few days, so we decided to hotel it in Banff at the Banff Rocky Mountain Lodge. At $299 CAD it’s a deal in the Banff area – and as the idea of spending two nights in a tent getting rained on just didn’t appeal to us, we jumped on it. 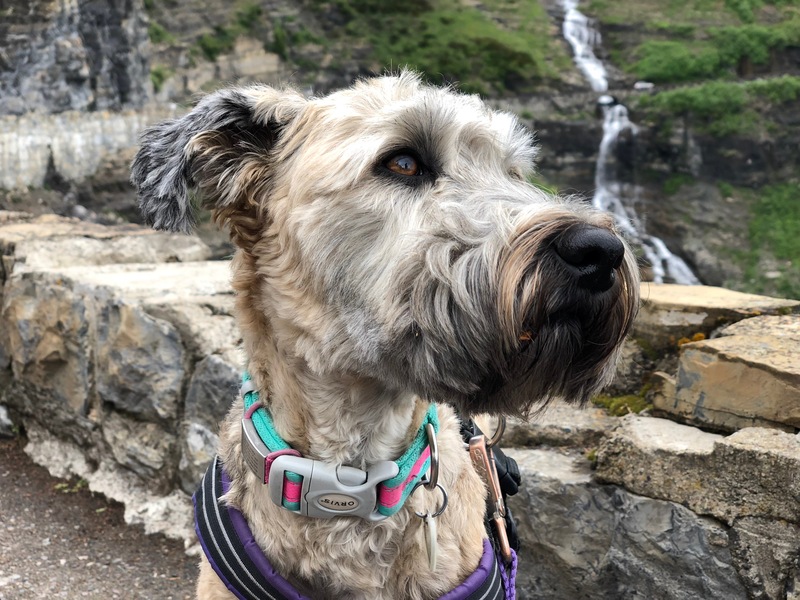 Doggie update: Maggie has been great – she was in and out of the car all day but as we were in a National Park she was restricted from all trails. She still got in a good bit of exercise and made lots of friends and got lots of pets from people we met on the road. Crossing the border into Canada was a breeze – we had her complete vaccination record printed out and ready to go and that was all that was needed. Canada so far is much more pet-friendly than Montana – dogs seem pretty welcome everywhere (in our so far pretty small sampling of Waterton and Lethbridge) One big difference is in the National Parks where dogs can go on trails and campgrounds as long as they’re on leash – it’s the reason we brought Maggie. 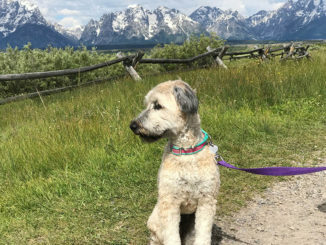 It’s such a big deal in the U.S. – to the point I really can’t see why people take their dogs to any National Parks. If we decide to do a National Park trip in the U.S. next summer we’d leave Maggie at home, it’s that big of a hassle. Meanwhile in Montana while we found hotels that took pets, NO restaurants allowed pets, even in patio areas. That was a bit of a drag. 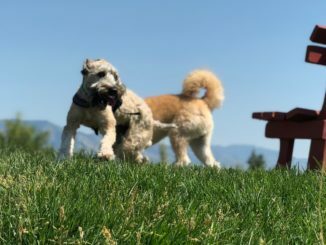 On the plus side, the dog parks we encountered in Butte and Kalispell were really, really nice – big green spaces where dogs could run and play. And we’re talking tons with populations of under 5,000 people. In a honking big city like Long Beach CA you’d think we could do better than the barren, small spaces we set aside for dogs to play off leash. But so it goes. Greetings from the wrong side of the Cascadia Subduction Zone!